Collin Shapiro, UMass Amherst, is thrown out stealing second in the bottom of the third by Rox shortstop Charlie Maxwell, Northwestern University. 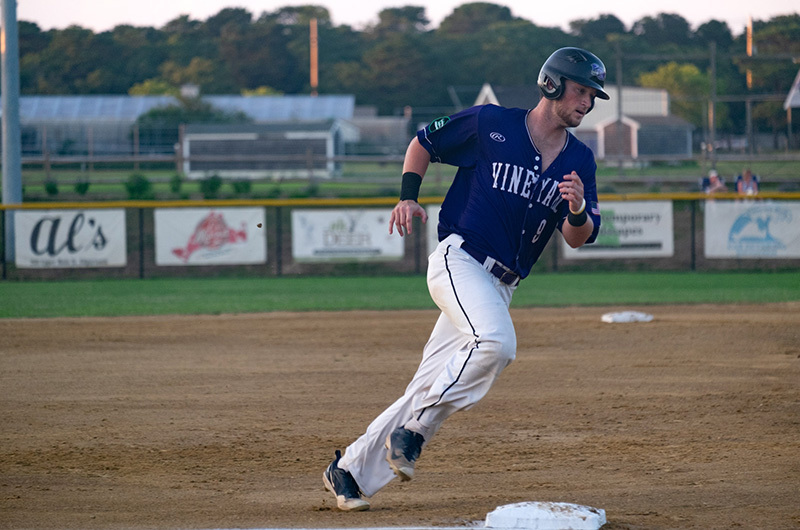 With timely hitting, shut-down pitching and some flashy defense, the Sharks advanced to the Futures League world series with a 5-0 victory over the Brockton Rox at the Shark Tank Thursday night. 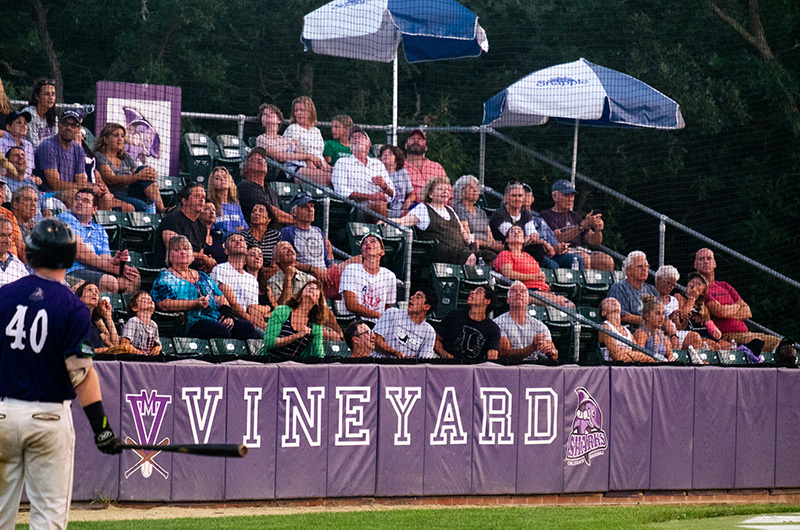 Game one in the series is tonight against the Worcester Bravehearts on the Vineyard home field. The start time is 7 p.m.
On Thursday, tied 1-1 with the Rox in the playoff series, the Sharks knew it was their night even before the game began. The Vineyard squad spent pre-game warmups kicking around a beach ball, high-fiving young fans and basking in the technicolor twilight of an August night at the ballpark. The Rox quietly played catch and stretched on the shady side of the field. As leadoff hitter Matt Chamberlain trotted into the batter’s box, all 30 players in the Sharks dugout erupted in a roar. The crowd quickly followed suit. Rox starting pitcher George Goldstein, from Middlebury, sidearmed a pitch over the heart of the plate. Chamberlain cracked a sharp single to right field. Even with the good pregame vibes, the rubber match between the two opponents was a hard-fought, scoreless pitching duel for most of the evening. Sharks starter, lefty Shawn Babineau from Springfield College, matched every no-run frame from counterpart George Goldstein with a goose egg of his own. 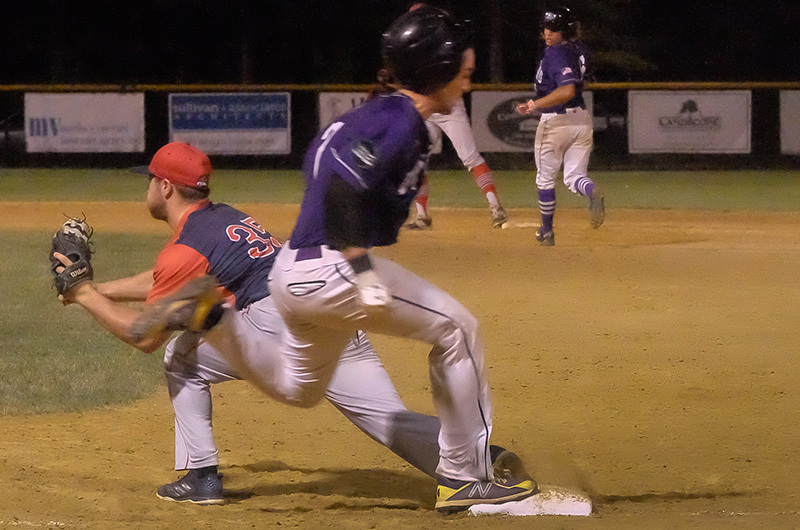 In the top of the fourth, with the Rox threatening, first baseman from Stetson, Eric Foggo, made a diving stop to get the first out, and then turned a silky double play to get the next two. In the fifth, after Rox catcher Jack Kelly became one of the only players in the league to successfully hit a ball over Matt Chamberlain’s head in center, third baseman Jackson Raper made a barehanded play to keep the game leveled at 0-0. Babineau exited in the sixth, finishing with 83 pitches, five strikeouts, and most importantly, no runs. The Sharks broke the stalemate in the bottom of the sixth. Left-fielder Collin Shapiro started the inning off with a soft single between the first and second-base hole, Chamberlain followed with a walk, and Kellen Hatheway moved the pair over with a bunt down the third baseline that was effective if not pretty. Matt Oldham took an intentional walk and Eric Foggo took an unintentional walk to get the Sharks on the scoreboard. Goldstein left the game, and after that the baseball finally started to look like the beach ball the Sharks hoped it would. Jackson Raper broke things open with a hard single to right. Tate Kolwyck had another hit to center, and by the time Collin Shapiro struck out in his second at-bat of the inning, the Sharks were up 5-0. “It’s been a great season,” said Sharks fan and player-host Christine Cardoza as Nate Tellier struck out the side to close the game. She has had three Sharks, Matt Chamberlain, Tate Hagan, and Maverick Latour living with her already-big family all summer. “We were hesitant at first, but we got three good ones. Matt’s got that cheeseburger grin. He loves to ask about the ‘dinner situation.’” She said her dog Olly, a German shepherd, husky mix, will miss the boys the most. But they aren’t leaving yet. The world series starts tonight, with Dalton Ponce from St. Mary’s taking the mound at 7 p.m. at the Shark Tank. “We don’t want to say goodbye,” Ms. Cardoza said.